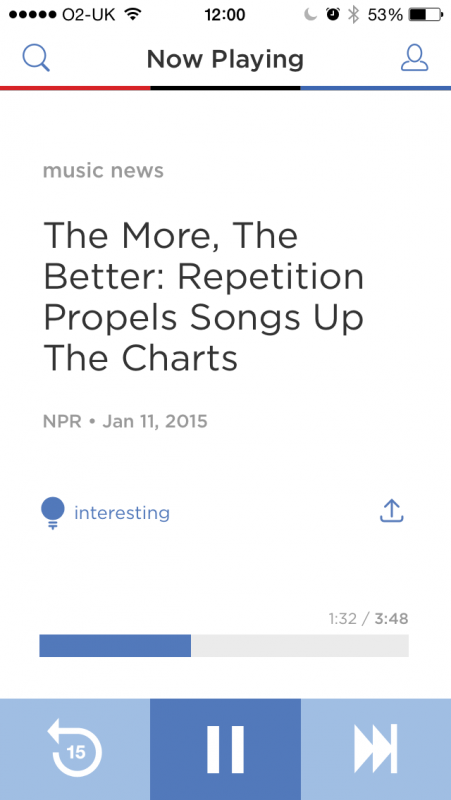 NPR One – The blueprint for mobile radio apps? There is no denying that the online music streaming industry is over-saturated. Just off the top of your head you would probably be able to name Spotify, Pandora, Deezer, SoundCloud and Grooveshark. And that’s just the big international players – imagine how many more, local, music streaming services there are the world over. Just last week it was announced that Tesco’s ex-music streaming service, Blinkbox Music, is to be sold to Guvera, yet another such service, hailing from Australia. French service Deezer acquired US based Muve Music to expand their music streaming footprint in America. And yet again this week we have been informed of two – yes, two – more music streaming services that we should keep our ears peeled for – Boomio and Nusiki, who both lay claims to providing users with services that are different, and better, than their competitors. Brian Hewitt, co-founder of Chicago-based Nusiki, has described this new app as ‘if Instagram and Spotify had a kid’. The secret, it seems, in launching these new apps, is in implementing small features which other apps have overlooked and making a big fuss over that. Spotify shares music too publicly? Ok, we’ll make our sharing system more controlled, as in the case of Nusiki. After all, it’s the little things that make the difference, a phrase that seems to carry a lot of weight in the world of music streaming. Boomio’s mantra seems to be ‘sharing is caring’ as users pick a song to listen to and share, and at the end are prompted to either re-share in order to hear the next song or buy the track on iTunes. Sharing can be done to an individual, a group, or a social network. But at the end of the day, music streaming services are limited in what they can offer to the listener when compared to the content of radio. Radio stations are of course already available on mobile phones, but they often lack that element of personalisation that such services as Spotify and Pandora offer. But what if there was an app that brought to you relevant news and stories, in bite sized chunks, from your local radio station as well as internationally, with the curation aspect of music streaming services? Larry Rosin, president of Edison Research, has recently talked about one such app – NPR One. Dubbed ‘Public radio made personal’, it is available only in the US, although users worldwide can still download it and listen in. The app itself has many great qualities, but it’s not just good; it could well be a blue-print for future radio apps with which to take the online audio platform by storm. The advantages of radio are numerous and well-known. One of the oldest social mediums, it still continues to have a large relevance in people’s day-to-day lives. What NPR One does so well is offer their listeners efficiency. Up-to-date relevant news and stories, in under 5 or 10 minutes. Like the music streaming services, you can skip stories, flag your favourite, and share. But it also reminds the listener that there is a local public radio station as part of its programme, and one that needs financial support. Through this scheme the app inspires a wholesome community feel; radio really does bring people together. Of course, NPR One only deals with news and stories; there is no music, no presenter tete-a-tete, no real-time traffic and weather updates. But all of these typical radio features could be merged with NPR One’s principal concept to create great personalised radio apps, which would have a better value to listeners than all the current numerous music streaming services which fundamentally all do the same thing, albeit in differently packaged ways. And it’s not just broadcasters and listeners who would benefit from such apps; advertisers too could cash in by the implementation of personalised user-targeted ads. The moral of the story? NPR One have a great mission and concept. Taken on a global scale and implemented by other radio apps, mobile radio would certainly offer much more than music streaming services – the varied content of radio, with the curated personalisation of music streaming, and adverts tailored to both listener and broadcaster. We all know that radio as a medium is still going strong, with audience figures constantly on the up, and it’s refreshing to see that younger listeners haven’t been completely sucked in by the world of streaming – at least, not in the UK.